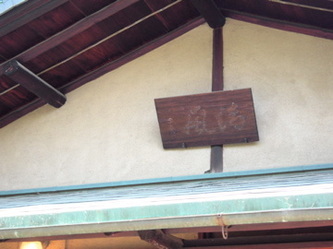 This Teahouse had been a secret gem of the Pasadena Temple. 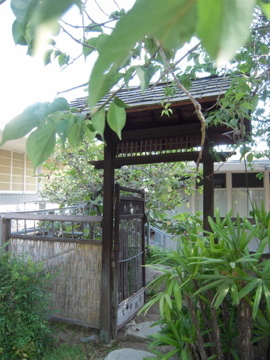 Located behind the annex, hondo and the gymnasium in the Japanese garden that had been kept by Mr. Sakahara and other members of the temple. Unless you went to see the temple garden, you would not have seen this special building nested comfortably between the sculptured trees, walking stones, and stone fountain. In 1964, the 14th generation Headmaster of Urasenke school, Tantansai, donated this 4 1/2 mat Daime-dero teahouse to the Pasadena temple to help promote the philosophy of Chanoyu (the Way of Tea) in the United States. This tea house was given the name Seifu-An, "Arbor of Pure Wind". 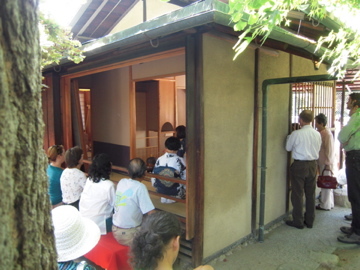 Since its opening, this teahouse had been used by the Pasadena tea group Sei-Sa-Kai for lessons and tea ceremony. The Sei-Sa-Kai group provided the public with an informational tea demonstration during our annual Obon festival. 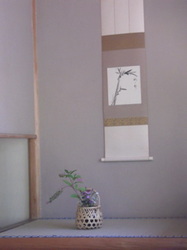 Madam Soju Sakahara had been the head tea instructor and keeper of this teahouse. 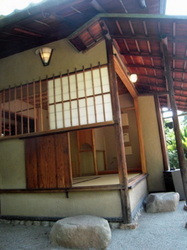 This teahouse was donated to the Huntington Library and Gardens in 2010 for use in their refurbished Japanese Garden. 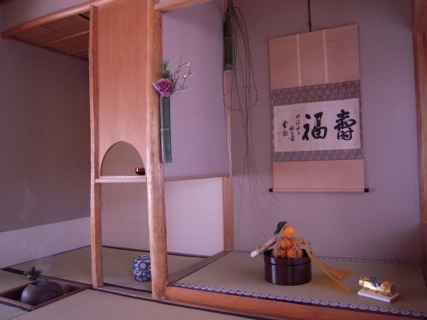 The temple board wanted to make sure that this teahouse would go where its beauty and history could be appreciated and seen by many. Photos below were taken at the Pasadena Buddhist Temple before the renovation and relocation. 70 friends of the Pasadena Buddhist Temple were given a special tour of the Seifu-An at the Huntington Library and Gardens. The group included Mrs Sakahara, Bishop Umezu, Rev Rosenthal, Rev Unno, and Rev Okada and many others. A special showing of the rebuilding of the Seifu-An was shown to the group at a small reception sponsored by the Huntington. The Huntington wanted us to know that the Seifu-An will be well taken care of and that we are all welcome to visit it at any time. They are so grateful for this donation. 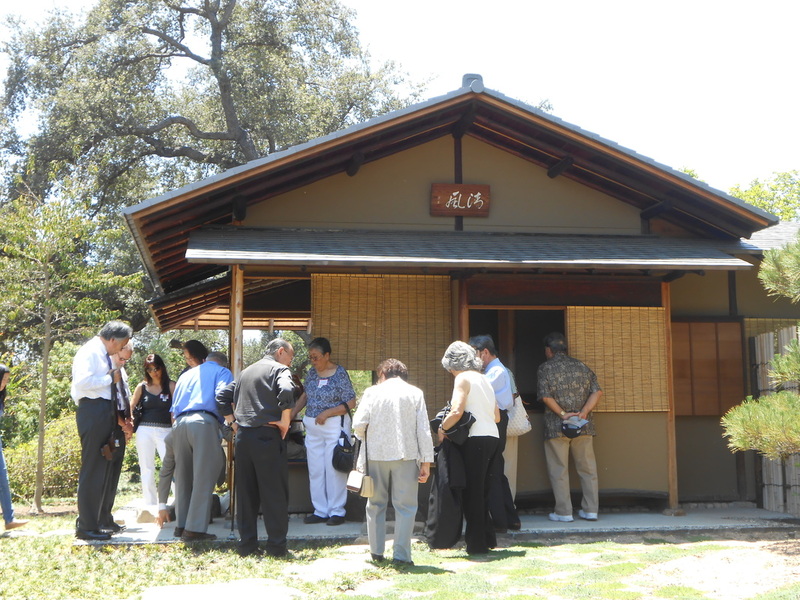 On Sunday, April 1st, the Board of Directors visited the Huntington Libary & Botanical Gardens for a special preview tour of the renovated Japanese Garden, site of our donated Tea House, "Seifu An" (Arbor of Pure Breeze). The tour was led by Mr. Jim Folsom, Director of Gardens.